With a sporting pedigree such as Toyota you would expect their front engined rear drive 2+2 Toyota GT86 Coupe to be the real deal and it is. This car is immensely fun to drive in a straight line but it’s when you factor in corners that it really comes to life. Steering is direct with plenty of feedback from the wheels so you know exactly what the GT86 Coupe is doing. This is an affordable sports car within everyone’s budget. Available in 3 trim levels however this only comes with a petrol version. The 2 litre 197bhp petrol manual is the fastest reaching speeds of 62mph in just 7.6 seconds. The automatic version takes 8.6 seconds. Extra urban MPG comes in around 44 for the manual and 50mpg for the automatic. The interior houses 4 seats with plenty of comfort and space making it ideal for everyday use. The steering wheel and driver’s seat is fully adjustable to get that all important correct driving position. Push button start, cruise control, keyless entry and dusk sensing headlights are all standard on the entry level version. The 237 litre boot houses luggage or shopping with ease. 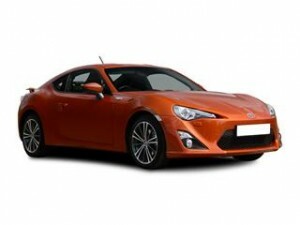 Here at Coast2Coast Cars we could make it as much fun to buy the new Toyota GT85 as it is to own and drive. We have direct relationships with a UK wide network of dealers who all have options that could save you hundreds or even thousands of pounds on the purchase price. It takes just a few moments to get your quote with no obligation to go ahead also. See what finance options you have too subject to status with direct Toyota finance.